Legions of the undead are at your door, trying to claw their way inside. Starved and alone, you make your stand. Will you survive? Apocalypze is a strategic card game that puts you, the player, right into the action of a post apocalyptic world... a world where the undead are the dominant species and the hours of those left behind are numbered. Lead your group of survivors in an ongoing fight against the endless hordes of undead, ruthless opposing factions, and bitter starvation. Build upon your defences, conserve your resources, and devastate your opponents with bloodthirsty raiders! 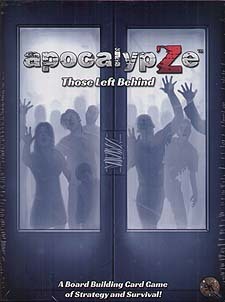 Do you have what it takes to survive the Apocalypze?